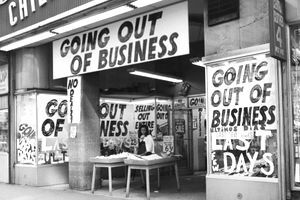 The longer you invest, and the more annual reports and Form 10-K filings you read, you are going to find yourself coming across breakdowns in a company's reported profits organized along two lines: continuing operations and discontinued operations. The conditions that lead to this distinction being necessary can be as varied as the stars but usually involve either shutting down a unit that was losing money, selling a subsidiary for one reason or another or spinning off (in some cases, splitting off) an operating division. While this is perfectly understandable - times change, businesses must adapt, different lines of business become more or less attractive as a result of market forces, regulatory shifts, political environments, and technological advancements, and a host of other considerations - it does present a problem for showcasing past financial data to potential investors, be they stockholders or bondholders. If the figures from the former business activity were included in the past numbers as they were originally reported, it could lead to a wildly inaccurate impression of the nature of the company as it is now. The solution is to strip them out as if they were a separate company or had never existed. Allow me to use a historical example from the dot-com era to demonstrate how continuing operations and discontinued operations might arise on the income statement. In the 1990s, Viacom, owner of MTV, VH1, and Nickelodeon, purchased Paramount Studios. To pay for the acquisition, Viacom took on a large amount of debt. The company's Chairman, Sumner Redstone, began selling assets and businesses the company owned in order to help pay down this debt; even perfectly fine businesses that it had been happy to own in the past. Simon & Schuster, a major book publisher, was one of the businesses Viacom decided to let go, ultimately selling it to British media group Pearson PLC for $4.6 billion dollars. How did the deal affect the company's revenue and earnings? This is where discontinued and ongoing operations come to the rescue. As soon as Viacom sold Simon, it had a pile of cash from the buyer. However, it lost all of the revenue and profit the publisher generated. Viacom's management must somehow warn investors, "Hey, Simon generated [X amount] of our profit and revenue. Since we no longer own the business, you can't plan on us earning this revenue and profit next year". To do that, the Viacom puts an entry on their income statement called "Discontinued Operations". This shows investors money that was earned from businesses that won't be part of the company's holdings for very much longer. In most cases, discontinued operations occur because management thinks the new business will perform better than the old business. Doing this, which is required by the accounting rules, anyway, allows them to highlight the apparent superiority of the surviving entity so that investors can assign a richer price-to-earnings ratio to the stock. Continuing operations are exactly what they sound like - the businesses the company expects to be engaged in for the foreseeable future. After all of these expenses are deducted, the investor is left with a figure called net income from continuing operations. This is a calculation of the profit generated by continuing operations during the period covered by the income statement. The amount shown on the income statement under discontinued operations is the profit made during the period from the businesses that will not be a part of the company in the future.